The Post Holiday Cleanser if great for those times when we have over done it while celebrating with food and drink and our body is crying out for help. I think most of us have experienced that sluggish and perhaps sickly feeling of having enjoyed ourselves too much the day(s) before. That’s where a good juice cleanse can really set things right. And this is a good juice to get the rejuvenation process started. This juice was really great tasting even with what can be some rather harsh ingredients. 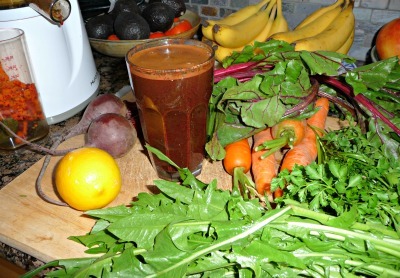 The carrots and lemon really help make it a very nice palatable juice. Of course I’ll give my usual warning to those who are new to juicing and cleansing: Go easy on the beet as they can cause a quick response cleansing with a bubbly stomach and frequent trips to the toilet. My Hurom juicer got the job done as usual and clean-up was quick. Dandelion Greens are a blood cleanser, a detoxifier, and a great digestive aid. They contain good amounts of vitamin C, B1, B2, B6, beta carotene, vitamin K, and vitamin E, as well as copper, magnesium, potassium, folate, iron, potassium, calcium, sodium, zinc, manganese, phosphorus, and omega 6. Dandelion greens are also high in fiber. Parsley is a diuretic and overall tonic. Parsley is high in vitamin K, vitamin C, beta carotene, copper, magnesium, potassium, zinc, selenium, iron, manganese, phosphorus, calcium, and sodium. It is also high in fiber. Beets are great for the digestive system and an amazing liver and kidney cleanser. They are high in iron, manganese, potassium copper, magnesium, and potassium. Carrots are one of the richest sources of beta-carotene and can protect against cancer as well as dissolve accumulations such as tumors and stones. 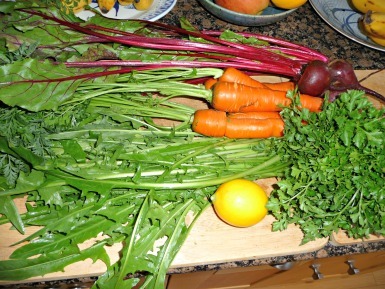 Carrots are very alkalizing, cleansing & nourishing which is why they are particularity good for this juice. Not only are they very rich in beta carotene, but in many other vitamins, minerals, and enzymes. Lemons are said to be the most potent detoxifier of all the citric fruits. They are very cleansing, and have an alkalizing effect, which really helps with this juice application. Lemons can kill intestinal parasites and dissolves gallstones. It’s said lemons are good to eat for heart problems, strokes, cancers, constipation, the blood and nerves. They are high in Calcium, phosphorus, magnesium, and potassium. The combination of these cleansing and rejuvenating ingredients helps make the Post Holiday Cleanser a great juice for combating the morning after feeling of having done everything to excess. You may enjoy some of these other Detox Diet Recipes to help you get cleaned up and back into shape.